A sun glint on Earth is captured (center of the black circle) in this image taken by NASA's Deep Impact spacecraft as it looked at the north pole. The reddish area is North America, and the glint is coming from a body of water in California. To find Earth-like worlds around other stars, scientistsshould take a page from our own planet, a new study found. In particular, observers should look for glints of sunlightreflected by oceans or lakes, such as what's seen by spacecraft looking back onEarth. These glints are tell-tale signals of liquid, which could indicate thepresence of liquid water, considered one of the fundamental necessities forlife. The glints can be seen in new set of videos taken of Earth byNASA's Deep Impact spacecraft,currently about 11 million miles (17.7 million km) away. The Extrasolar PlanetObservations and Characterization (EPOCh) project aims to use the tapes to helpcharacterize other worlds beyond the solar system, called extrasolarplanets. Some of the most revealing features in the new data are theflashes of sunlight reflected off Earth's oceans and lakes. The planet andspacecraft must be positioned just right for light to bounce off in this way.And it only happens with liquid and ice, which are smooth enough to produce theeffect. Land masses are generally too rough to create glints. "These sun glints are important because, if we saw anextrasolar planet which had glints that popped up periodically, we would knowthat we were seeing lakes, oceans or other large bodies of liquid, such aswater," said Drake Deming, deputy principal investigator of EPOCh, who isa researcher at NASA's Goddard Space Flight Center in Greenbelt, Md. "Andif we found large bodies of water on a distant planet, we would become muchmore optimistic about findinglife." 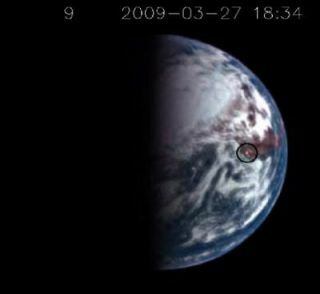 The EPOCh team just released a set of videos from thespacecraft that show the first view of Earth for a full rotation from the northpole and the south pole. The researchers expected to see sun glints, but weresurprised by the intensity and small focus of some, said Richard K. Barry, alsoof Goddard. The glints appeared over oceans, and in some cases, overland masses where there were large lakes. Barry is compiling a catalog thatwill connect each observed glint to an exact location on Earth. The researchers are also connecting other signals seen froma distant view of Earth with known features of the planet. For example, theyfound that when a large expanse of bare land, like the Sahara Desert, rotatesinto view, the planet's overall color appears to change slightly, becausecontinents reflect light differently from oceans. This information could helpto characterize other planets discovered in the universe. Deep Impact?s EPOCh project is part of an effort to recyclethe spacecraft?s surviving component after it fulfilled its original mission toobserve the intentional crash of an impactor probe on the surface of a comet in2004. "This is just the first step in trying to understandthe nature of the surfaces of extrasolar planets," said Michael A'Hearn,principal investigator for Deep Impact's extended mission.